All objects have been recoded, remeshed, remapped, and retextured. Most are linked to the swing. The swing you might recognize started as the Season's pre-order swing, but it's been seriously reworked to be recolorable, and basegame compatible. With the exception of the things that are obviously cloned from AL objects, the rest of the set is basegame compatible as well. Ok, this next bit is going to take some time, but please bear with me. 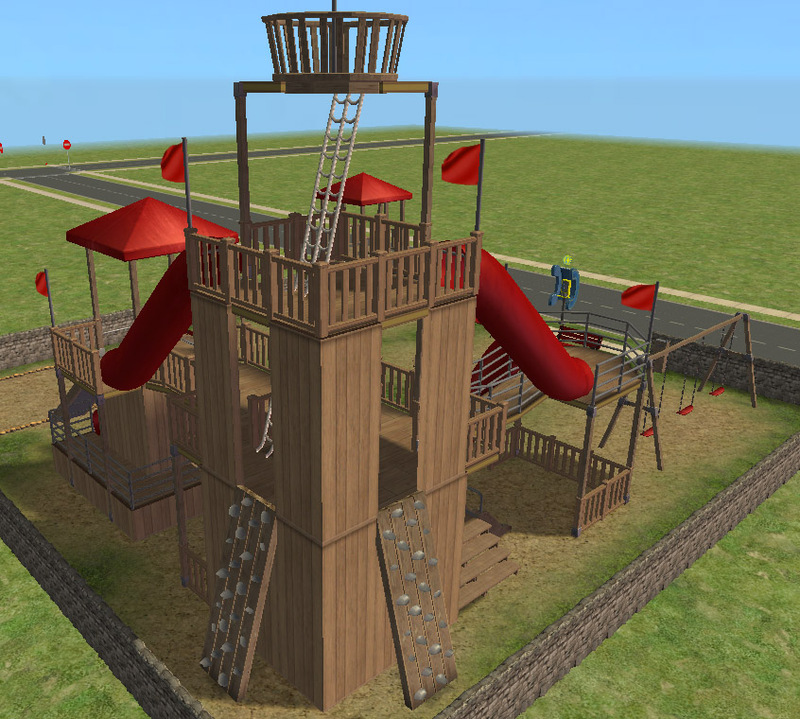 Climbing Tower (AL) - This great climbing tower is available for kids and teens. It has a working fireman's pole in the center and chainmesh, ladder, rockwall, and metal squiggle to climb up. Two recolorable subsets, linked to the swing. Drinking Fountain (BG) - This handy little drinking fountain works for kids and up, it fulfills hunger and depletes bladder, both slowly. It has one recolorable subset, linked to the swing. Thank you Rebecah for the awesome animations and base object! 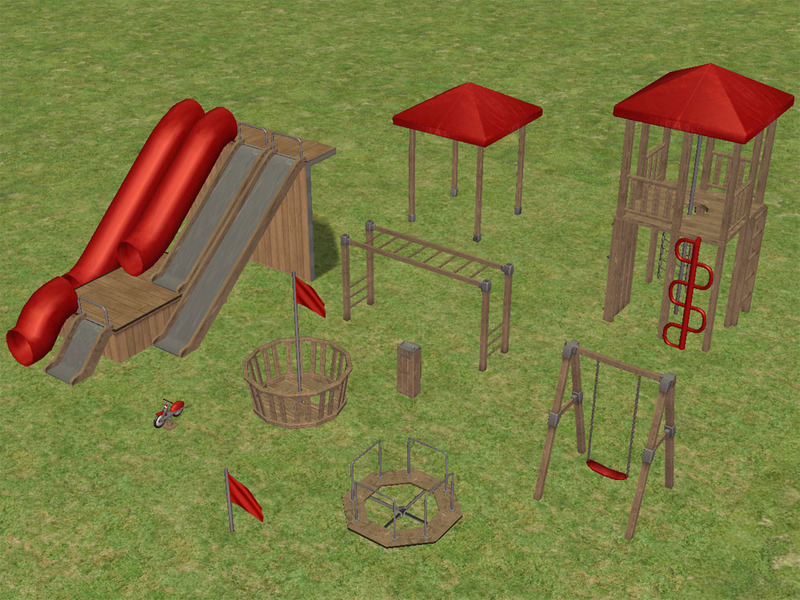 Flag and 7 recolors (not pictured) (BG) - A fun little animated flag to place all around the playground, including fence posts! Comes in red (mesh), black, blue, green, yellow, white, purple, and orange. This object is the flag subset master, used in the Look Out object. Known Issue: This sometimes has a hard time placing, but move_objects takes care of any stubborn spots, sorry! Thank you frillen! Go Round (AL) - Simple remesh of the AL one. Kids spin it. It has one recolorable subset, linked to the swing. 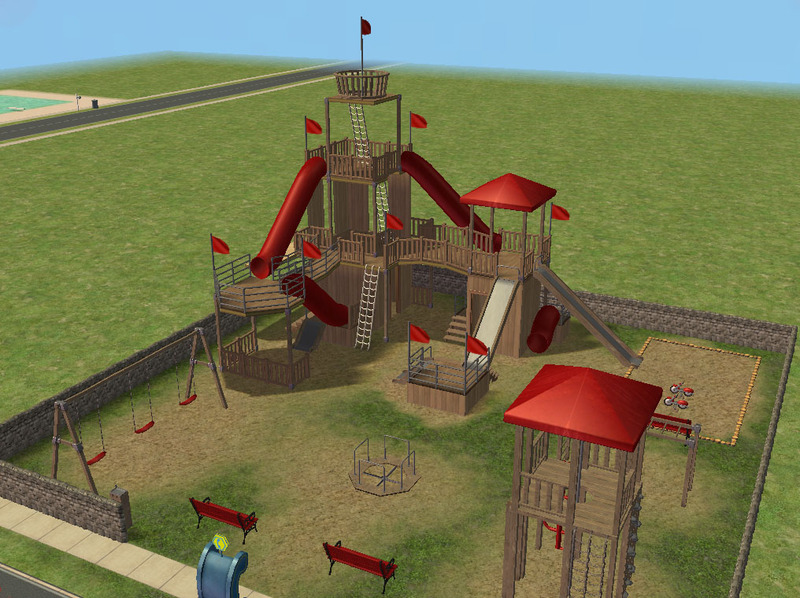 Look Out (BG) - A fun Look Out post for kids and up to play pirates in. It has two recolorable subsets, linked to the swing and flag. Known Issue: I could not get it's green tile footprint to match, please make sure when placing this that you do not use any tiles except the one where the hole is cutout for your ladder or stairs. Monkey Bars (AL) - Simple remesh of the AL version. It has one recolorable subset, linked to the swing. 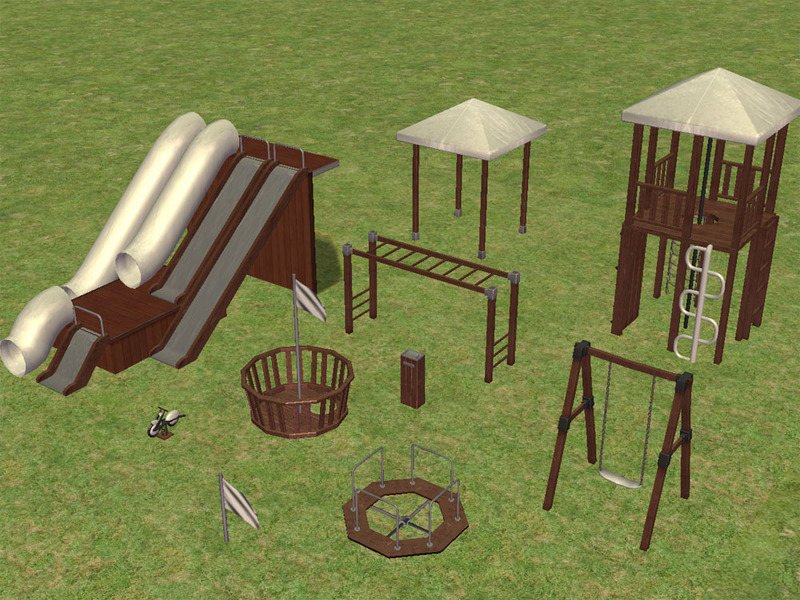 3 Tube Slides (BG) - Three fun slides of different heights, available for toddlers and kids. It has one recolorable subset, linked to the swing. The long slide is placed from one floor the the one below it. The medium one places from one floor to a stage or foundation on the level below, and the short slide places from a foundation (not a stage!) to the same level. Slides need two spaces free on top to use. Thank you Jasana for the base object and animation! 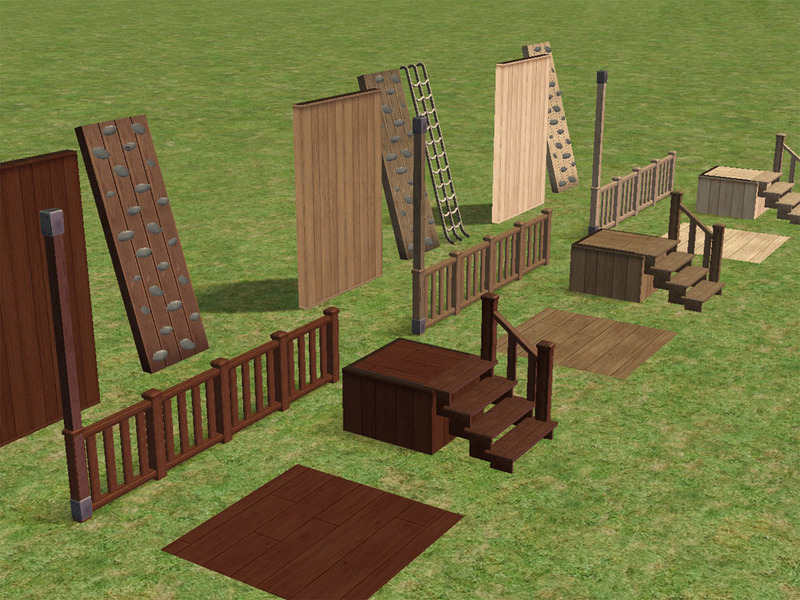 3 Metal Slides (BG) - Three fun slides of different heights, available for toddlers and kids. It has one recolorable subset, linked to the swing. See above for placement. Thank you Jasana for the base object and animation! Spring Rider Motorbike (AL) - Fast little motorbike spring rider for toddlers. It has two recolorable subsets, linked to the swing. 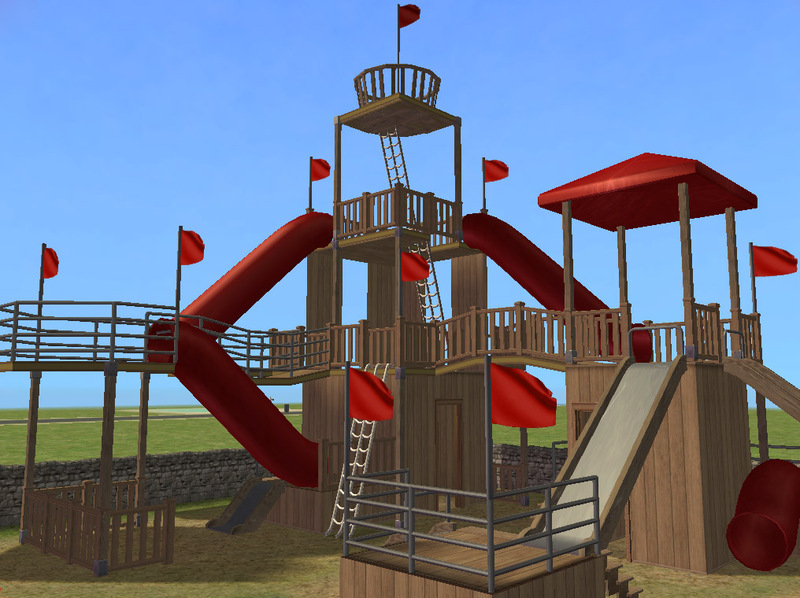 Sun Cover (BG) - Simple decorative sun shade that matches the climbing tower. Cloned from Lethe/Echo's rug so it won't block anything. It has one recolorable subset, linked to the swing. Thank you Lethe/Echo for the base object! 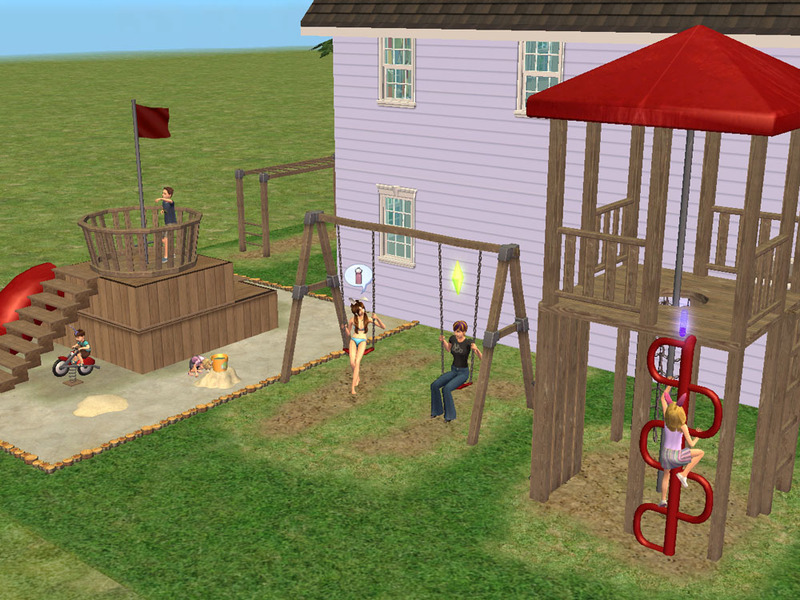 Swings MASTER (BG) - Great wooden swing, connects with itself like the Maxis ones. It has two recolorable subsets. 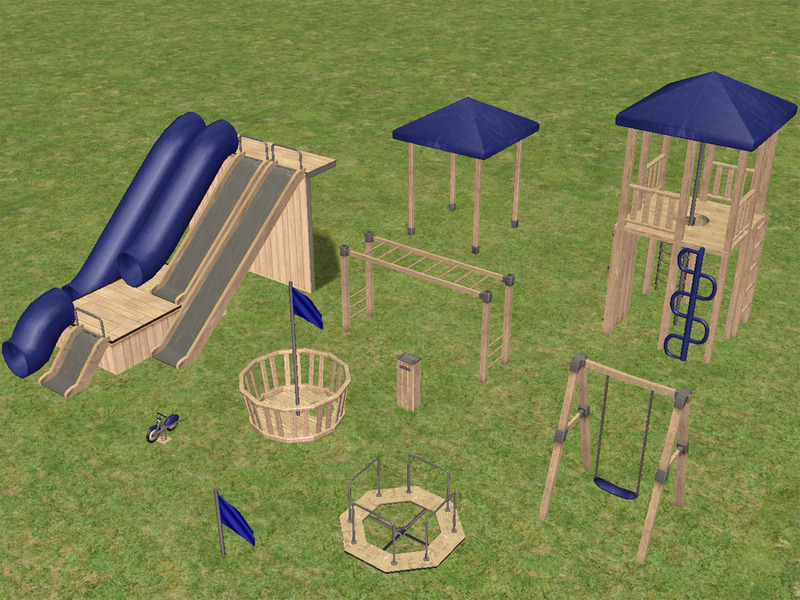 This piece must be included in any lot that is uploaded with any of the other playground pieces. Without it, they don't have their textures and end up missing or flashing blue. This swing WILL REPLACE the SSN preorder one. The mesh is identical, only the textures have changed. I apologize for any distress this may cause, but having two identical swings in my catalog would drive me crazy. Climbing Mesh (BG) - Simple climbing structure used for getting from one level to another. One subset, linked to the swing. Thank you Marvine for the base object and animations! RockWall (BG) - Simple climbing structure used for getting from one level to another. It has one recolorable subset, linked to the swing. Thank you Marvine for the base object and animations! Column (BG) - Support structure offset to the corner of a tile and stretched to be tall enough. It has one recolorable subset, linked to the swing. 3 Wood Fences (BG) - Similar to the regular wooden fence, this one has been shortened to accommodate the shorter people on the play equipment. Comes in three wood colors. Metal Fence (BG) - Similar to the metal fence, this one has been shortened to accommodate the shorter people on the play equipment. 3 Floors (BG) - Comes in three wood colors. 3 Walls (BG) - Comes in three wood colors. Recolorable Stairs (3 colors) - Similar to the deck steps, this one is open underneath and is recolorable. It is also linked to the swing. Scriptorium file included. Please see the Scriptorium thread for instructions on how to install. I've included the lot I've used in my pictures. The CC is NOT included in the package (as per my own policy!) so you still need to download the main file. It's a comlot, 2x2, and I don't remember off hand what it costs. The lot requires AL. Here's to another great year at MTS!!! Big thank you to Echo! Without your help, many of these items wouldn't have gotten off the ground. Thank you to Lee and HL for helping me figure stuff out when it wouldn't work. Deep thank you to the original creators of the objects I cloned from or based my mesh from; I couldn't have done half of this on my own. Jasana, Marvine, sartake, rebecah, frillen, Lethe/Echo, and feeEssen, THANK YOU! And finally my downloaders, your comments are really what keep me creating. If not for you I prolly would have gone off to my 'hoods and never surfaced again. I feel kind of bad for my neglected families, but maybe I'll take the rest of the summer off and play them. 2268 people have said thanks to Phaenoh for this download.